When you are looking for the best dog food to feed your Labrador Retriever there is a seemingly endless variety to choose from. Just by browsing the shelves at your local super market or pet store you will find literally hundreds of different foods, flavours and types. Do you choose wet food, dry food, a combination of both or do you make your own homemade dog food? Do you buy the expensive stuff or the economy brand. Is the food you are considering good for your dog? Will he like it or spit it across the kitchen floor? Do older dogs need different food than puppies? There are so many questions but hopefully we can provide a few answers here - or at least put you on the right path. What Ingredients Are In The Best Dog Food? The most important thing with any food is that it is nutritious and good for your dog. Of course most foods will claim to be full of nutrients but forget all the colourful packaging and the TV commercials showing cute dogs wolfing the food down - read the label and see exactly what is in the food. Essential ingredients in any dog food are protein such as meat and grain along with vitamins and minerals. Protein is usually provided by one or two different types of meat which dogs find very easy to digest. Grains and vegetables are also sources of protein but they should be complemented by the meat. At the risk of upsetting some very well intentioned people simply feeding dogs vegetables with grain will not provide sufficient levels of protein. Be careful with grain as too much of it in the food could be upsetting for your Labrador retriever as our canine friends find it difficult to digest too many carbohydrates. The best dog food is low on carbohydrates. Also look at the label to see which preservatives have been used in the food. Chemical preservatives such as carcinogens can be very harmful and only natural preservatives such as Vitamin C & E should be used in dog food. On the face of it this is pretty straight forward. If you have got a puppy feed him puppy food. Right? Not always. Specially formulated puppy food contains huge amounts of protein and fat which is generally great but not for larger breeds such as a Labrador Retriever. For smaller breeds the high protein and fat content is beneficial but for larger dogs it can pose a problem. Specifically, specialist puppy food may cause your Labrador puppy to develop too quickly which can lead to muscle problems later in life especially hip dysplasia. So, although it may seem counter intuitive larger breed puppies are often better to be fed on adult food. Of course the caveat here is that they should not be fed adult portions! Also, in recent years the best dog food manufacturers have started to market puppy food specially formulated for larger breeds. Have a look to see if your pet store stocks this food. One of the benefits of feeding a puppy with adult food is that once he reaches the adult stage you don't have to wean him onto a different type of food. Simply adjust the size of the portions and off you go! If you do need to change foods make the changes gradually by mixing the new food with the old food and slowly increasing the ratio of new to old until the dog is fully switched to the new food. This process should take 5 to 7 days. There are lots of dog food supplements on the market that promise increased health and vigour if fed to your dog. Take care with supplements. If you are using the best dog food that is high in nutritional value than you have no need of supplements. Using too many supplements can harm your dogs health and we would recommend only feeding your dog a supplement if advised by a vet. Many people seem to get very stressed out over whether they should feed the dog on just wet food or dry. Of course opinions differ but, for what its worth, my view is that puppies should be fed exclusively dry food but adults should have a mixture of wet and dry. 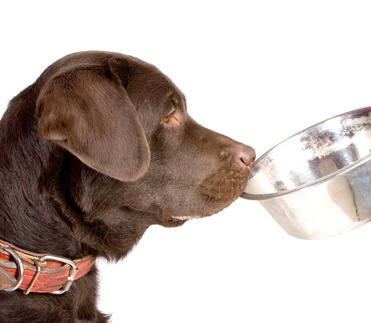 How you achieve this depends on how often you feed your dog but for our Labrador Retrievers their main meal consists of wet (tinned) dog food mixed with rice and pasta whilst mini meals are exclusively dry food. Experiment and see what your dog prefers. He will soon tell you which food he likes best (clue - watch the tail wagging when you fetch his favourite food). Making your own dog food is a worthy aim but is very hard work. It takes a lot of effort and opening a can or bag of readymade dog food is so much simpler. If you are determined to make your own food be very careful to ensure that the dog receives the right amount of protein and nutrition. For more information see our page on homemade dog food. Again there are so many different opinions here. Many people insist that dogs should be fed just once but in my opinion this is simply wrong. 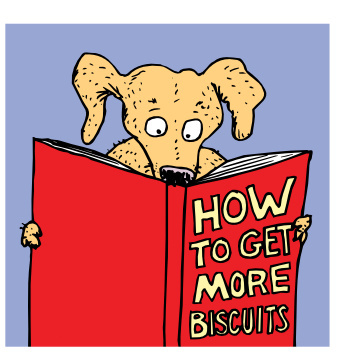 Dogs, especially Labrador Retrievers, love to eat so why restrict them to just one meal? A more practical reason is that only feeding a dog once a day will encourage him to eat quickly which can cause digestive problems especially bloating. Feeding your dog two or three times a day is ideal - personally I feed my dogs three times daily. Remember though to adjust your portions or you will end up with a dog the size of an elephant. Regular meals of the best dog food with regular exercise will ensure your dog is active and fit.